The best way to describe living with African parents is that it is a constant push and pull between modern American ways and conservative Religious values; it’s safe to assume that you already know where my Nigerian parents stand. My parents and I are immigrants from Nigeria. We were all born in Nigeria, but they lived up to adulthood there while I was brought to America at a very early age. Of course, since they have spent their upbringing in Nigeria, they hold on to a lot of views they have acquired since childhood— views on relationships, family roles, and religion, whatever you can think of. I came to America as a toddler and from early on I was exposed to a different way of life. This didn’t stop my parents though from imposing on me traditional views, which weren’t all bad. Some imposed views like Christianity and respect for elders I appreciate, especially in a society like America that can distort these values. However, some of my parents’ conservative views clash with my more modern ones. Here are just a few views: clothes, hair, American culture, and independence. Let me explain more in details. At a time, my parents could dress me in whatever and I wouldn’t complain. A hundred percent of the time was because I didn’t care, but now I am grown (I humbly say) and clothes have significance to me, wearing a bad outfit could kill my mood. My mother is a fashionable person in her own unique way, but her style is very different from mine. Just because she likes something, doesn’t mean that I will like it. Just because she buys it before consulting me, that still doesn’t mean I will like it, though sometimes I have to wear it. My mother and I have had many arguments in the past over her shopping for me. I simply pleaded, “Don’t do it anymore, let me shop myself” and I was accused of being disrespectful and unappreciative. But times are different; back then, your parents gave you what they could afford and that was that; but now, if we are fortunate to have options, let’s use them. In plenty of arguments with my parents, one of them says, “It is the American culture. If you were raised in Nigeria, you wouldn’t say this or do this…” First of all, I don’t understand what saying this adds to the argument. So if I was in Nigeria, maybe we wouldn’t have certain arguments, but how does that change the present or the problems we have now? My parents and I have had plenty of arguments about communication because I see a lack of it, especially for emotional problems. If you upset me, I should be able to talk to you about it. Now, I don't mean if you scold me and I’m angry with you— I mean talking about times when you have deeply hurt me and you failed to see that. So if communication is an American culture thing, I’m grateful I wasn’t raised in Nigeria. 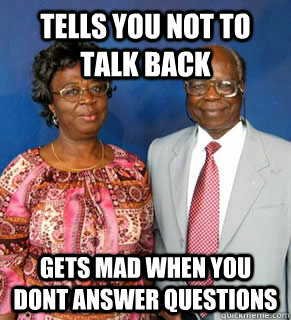 I have heard people say African parents believe they are never wrong, but this seemingly funny saying has deep effects. How are we supposed to grow in relationships if they can never admit to your faults? Of course, there are plenty of times when I am wrong and I need scolding for that, but what about when they are wrong? And if you try to tell them this, you are considered disrespectful. Another issue is independence. Yes, that desire probably is an effect of living in the land of the free, but I’m not talking about prodigal son-kind of independence. Independence like “hey, I’m a teenager, I like to hang out with friends and explore places.” I do not just want to sit at home all day. Of course I know my safety is their utmost concern and I understand my mother’s words, “Everywhere they [friends] call you isn’t where you need to go” about going to different places. But what about going to concerts or simply going over to a friend’s house? I understand the strictness when I was in younger, but I hope they ease up a bit. Do not get me wrong, I love my parents, I am happy that they raised me the way they did or else I wouldn’t be the person I am today, but I do get frustrated with their old ways of parenting sometimes. I do understand that I may come off as ungrateful since my parents are only doing these things out of their best interest, but it is from their point of view. I appreciate my parents and hope that they will be more aware of the changing world.